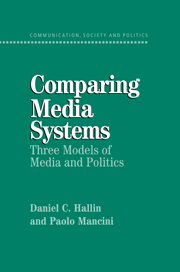 Proposing a framework for comparative analysis of the relationship between the media and the political system, this book surveys media institutions in eighteen West European and North American democracies. It identifies the principal dimensions of variation in media systems and the political variables which have shaped their evolution. It then pinpoints three major models of media systems development (the Polarized Pluralist, Democratic Corporatist and Liberal models) and explains why the media play a different role in politics in each of these systems. Part I. Concepts and Models: 1. Introduction; 2. Comparing media systems; 3. The political context of media systems; 4. Media and politics and the question of differentiation; Part II. The Three Models: 5. Mediterranean or polarized model; 6. North/Central European or democratic corporatist model; 7. North Atlantic or liberal model; Part III. The Future of the Models: 8. Homogenization; 9. Conclusion.